Jump at the Sun: Pa-cute! My cousin Nina sent this picture of Zoe last week ~~~ and I'm loving it to bits (hmm...except for the fact that my growing nose is also peeping here... shucks). This was taken in Tagaytay during our family reunion. 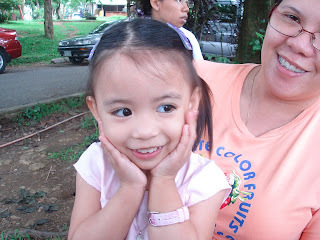 So pa-cute no? Anyway, I hope she'll stay as cute and charming as she is now.